Good Friday morning. Situational awareness: Sean Spicer isn't getting a contract from Fox News. But he can comfort himself with his fee for speeches, which I'm told is $30,000 in D.C. and $50,000 elsewhere on the East Coast (plus first-class air travel for two). But hate-watching "Morning Joe" down in the White House residence, President Trump was feeling cocky. His surprise deal with Democratic leaders may create midterm headaches for his party, but it's winning rave reviews from the academy. Trump scans the print N.Y. Times, and Tuesday's paper had taunted him with a Peter Baker analysis declaring that Trump's "first seven months in office have yet to produce any big deals." This morning, Peter is back as the lead author of a front-pager, "President Tries Taste of Comity As G.O.P. Stews," reporting that Trump called Chuck Schumer and Nancy Pelosi to crow about the morning cable coverage: "The press has been incredible." Our thought bubble for the president when he spontaneously made the fiscal package deal in front of a chagrined Mitch McConnell and Paul Ryan: "You say I can't make deals anymore? Hold my Diet Coke, and watch this! You say I'm beholden to Mitch and Paul? Watch me make a big deal without them!" A top aide puts it slightly more diplomatically: "He read the room. Instinctual. ... He's a dealmaker. He saw a deal." Do something popular: Play the part of the magnanimous populist president rising above partisanship to cut a deal. Get funding for Hurricane Harvey quickly and avoid a prolonged fight on Capitol Hill. Stick the middle finger to McConnell and Ryan — especially McConnell, with whom Trump is fed up. (He believes McConnell is a failed leader with low energy.) Trump has enjoyed thinking about Ryan and McConnell squirming while he parades his surprise deal with "Chuck and Nancy." Regrets? Trump has none. He revels in these moments when he can be unpredictable to the point where he confounds his own top aides and, especially, the press corps. Be smart: If Trump gets to the fourth paragraph of the N.Y. Times story, he'll be reminded: "He is a man of the moment, and the moment often does not last." It's like a fictional movie scene: A president wins election with harsh, anti-immigration rhetoric, then moves to terminate protections for kids of illegal immigrants. He's ridiculed on both sides for his heartlessness — but cheered by a band of white voters who helped put him in office. Then he suddenly realizes he looks like a cold-hearted jerk — and starts musing about going farther than President Obama got in providing permanent protections to those children of illegal immigrants. Trump does this the same day CBS News airs "60 Minutes" footage of Trump's campaign architect Steve Bannon not only defending a hardline approach, but accusing the Catholic Church of needing "illegal aliens to fill the churches." Why it matters: Like the debt-ceiling fight, Trump forfeited all his leverage before the negotiation. He has virtually no choice but to sign permanent protections into law — and little power to get significant wall funding in exchange. Sound smart: There's a chance this Republican president, with a Republican Congress, ends the year with this list of accomplishments: increasing spending, permanently lifting the cap on debt, propping up Obamacare after failing to repeal it, and offering new protections to children of illegal immigrants. P.S. "Trump's decision leaves 'Dreamers' unable to travel," by L.A. Times' Kate Linthicum in Mexico City: "A Homeland Security memorandum said the department would stop approving new applications for travel permits, known as advance parole." Only one poll number to remember this week: WSJ/NBC finds that Trump has 98% approval with Republicans who voted for him in both the primary and the general. Be smart: Don't underestimate Trump's power to do whatever the hell he wants and still keep his base voters. If they stayed with him through Charlottesville and "Access Hollywood," they're not going anywhere over a Beltway deal. Trump has an almost magical hold on his voters. He makes regular deposits in the Bank of Base, and has a nice balance. "The Russian information attack on the election did not stop with the hacking and leaking of Democratic emails ... Far less splashy ... was Russia's experimentation on Facebook and Twitter." "On Twitter, as on Facebook, Russian fingerprints are on hundreds or thousands of fake accounts that regularly posted anti-Clinton messages. Many were automated Twitter accounts, called bots, that sometimes fired off identical messages seconds apart." Why it matters: "The fakery may have added only modestly to the din of genuine American voices in the pre-election melee, but it helped fuel a fire of anger and suspicion in a polarized country." "Facebook ... has never acknowledged the glaringly obvious — that it is essentially a media company, where many of its 2 billion active monthly users get the majority of their news and information." "Would Donald Trump be president today if Facebook didn't exist? Although there is a long list of reasons for his win, there's increasing reason to believe the answer is no." Be smart: In an Oval Office interview with the Financial Times 70 days into his presidency, Trump said: "Without the tweets, I wouldn't be here." Trump's authentic, direct communication with voters is the sunny side of his social-media lift. This week's revelations uncover a darker side, with the potential that a vast swath of Americans were unwittingly manipulated. Be even smarter: We can't stress enough how much public and political opinion is shifting against the darlings of Silicon Valley. Watch for intensifying calls for new regulations on Facebook and others. "Worst case scenario now possible for Florida," according to Weather Channel. "Nuclear hurricane," says the L.A. Times lead print headline. Weather Channel latest: "Hurricane Irma, a potentially catastrophic Category 4 hurricane, is now hammering parts of the Bahamas and Cuba, and will turn its fury on Florida in what is likely to be the state's strongest hurricane strike since Charley 13 years ago." The big picture: "They call it the Big One — a mythic, massive hurricane that would obliterate the densely populated southeast coast. ... Irma, it appears, could be it. The storm has triggered near-panic in a region of more than 6 million people that includes Miami, Fort Lauderdale and West Palm Beach, clustered along a narrow ribbon of coastline that has seen nearly double-digit population growth over the past five years." While you slept ... "A major earthquake off Mexico's southern coast killed at least five people ... Houses toppled and the quake produced tsunami waves and sent people running into the streets in panic," per AP. "The U.S. Geological Survey reported the earthquake's magnitude as 8.1, but President Enrique Pena Nieto says it was 8.2, making it the largest in Mexico in 100 years. He also said it was bigger than the 8.1 quake in 1985, which killed thousands and devastated large sections of Mexico City. " 7. If you read only 1 thing: "On the brink"
Evan Osnos' "Letter from Pyongyang" in next week's New Yorker: "This summer, the prospect of a nuclear confrontation between the United States and North Korea, the most hermetic power on the globe, entered a realm of psychological calculation reminiscent of the Cold War"
More than any other capital that has been marooned by politics — Havana or Rangoon or Caracas — Pyongyang presents a panorama from another time. Soviet-era Ladas and ancient city buses ply the streets, while passengers stick their heads out the windows in search of cool air. Buildings are adorned with Korean-language banners hailing the "Juche ideology," the official state credo, which glorifies self-reliance and loyalty. On an embankment near a major intersection, workers in gray coveralls were installing an enormous red sign that praised the "immortal achievements of the esteemed Supreme Leader, comrade Kim Jong Un, who built the nuclear state of Juche, the leader in rocket power!" Iraq taught us the cost of going to war against an adversary that we do not fully understand. Before we take a radical step into Asia, we should be sure that we're not making that mistake again. Curl up with the whole thing. Rob Porter "is the White House staff secretary and assistant to the president for policy coordination. 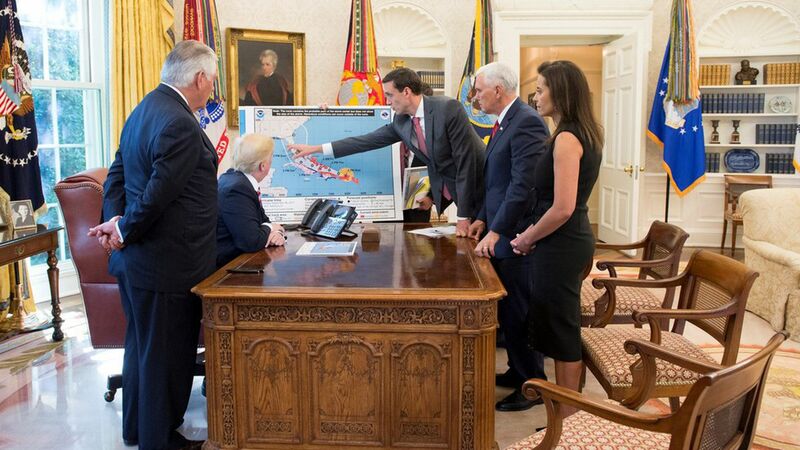 He has been at the helm since the Trump administration's first day. He's tasked with vetting and filtering what reaches Trump's desk. And under new chief of staff John Kelly, his role has been reinforced." "Porter ... has avoided getting caught up in any of the West Wing drama that has plagued the administration for the better part of seven months." "Created in December 2016 to harness the collective energy of America's postelection freak-out, the Arena aims to recruit, train, and support first-time candidates for office. ""The Arena was dreamed up by Ravi Gupta, a former staffer on Barack Obama's first presidential campaign. Gupta, now 34, served at the United Nations under Susan Rice before leaving government in 2010 to open a string of charter schools for low-income students in the South. "Why it matters: "Since Trump's election, the Democratic Party has found itself both invigorated and adrift. ... The Arena joins a crowded field of get-out-the-candidate organizations that have formed since the election, from Indivisible and Swing Left to Code Blue and Run for Something. ""[E]ach wants to transform the outrage and self-recrimination over Trump's election into tangible victories at the polls. Each believes that the Democratic Party has failed to recruit a diverse and viable slate of candidates." "For years, it was a slightly risky treat eaten in the privacy of Mom's kitchen. ... Now, thanks to the creation of cookie dough that doesn't include raw eggs or raw flour, you can indulge safely." "In the Bay Area, the guilty pleasure born in a mixing bowl is poised to explode in popularity, with dessert bars opening in the East Bay and San Francisco, online companies eager to ship jars to your door and grocery stores stocked with refrigerated batches of edible batter."